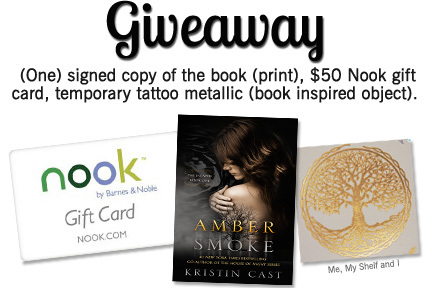 Two Chicks On Books: Blog Tour- AMBER SMOKE by Kristin Cast an Interview and A Giveaway! 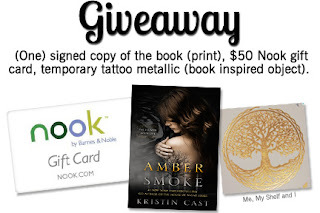 Blog Tour- AMBER SMOKE by Kristin Cast an Interview and A Giveaway! I am so excited to be hosting a spot on the AMBER SMOKE blog tour! This is Kristin Cast's first solo book (it's New Adult btw) and I can't wait to read it. I have an interview with Kristin to share today! And make sure to enter the giveaway to win an awesome prize pack! Haven't heard of AMBER SMOKE? Check it out! Hi Kristin! First I want to say welcome to Two Chicks on Books! 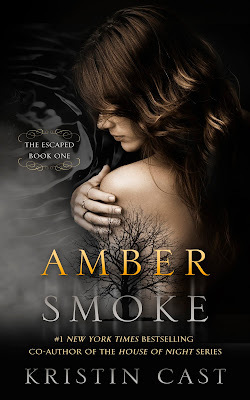 I’m really looking forward to AMBER SMOKE and am so happy that you could stop by for a visit! Is there a title for the sequel yet? I do have a title, but I don’t know if I’m allowed to release it yet. I will say this, I think it’s pretty frickin’ awesome! Lori, Eva’s mom, is based on my mom, the fab PC Cast. Eva and Lori share a similar relationship to my mom and me, and they have the same inside jokes and funny little things they say to each other. My favorite character to write definitely had to be Bridget. She’s so much fun! My least fave was Alek. He’s not from this realm, so he speaks and looks at the world differently than the other core group of characters. What is your favorite passage/scene in AMBER SMOKE? My favorite scene in AMBER SMOKE… There are so many I love, it’s hard to choose! Right now, my favorite is the big fight scene. (I won’t say much more about it because, spoilers.) I watched a lot of different action movies, and took notes about how the characters moved. I wanted to make sure it was intense, and I think I accomplished that. As strange as it might sound, a lot of my research comes from watching different shows and movies. I’m very much a visual learner, and I find things being acted out on screen very inspiring. I also read a lot of books on Greek mythology, and spent a lot of time researching police tactics and medical practices. Unfortunately, right now I don’t have time to read as much as I’d like to. I did recently finish ALIVE, which is the first book in Scott Sigler’s new YA trilogy. It was fantastic! You definitely have to get a copy when it comes out in July. I definitely have to stand by Heath Luck all the way! What inspired you to write YA and NA? I think AMBER SMOKE branches out into NA, which is still a relatively new genre. However, when I write, I don’t think about any of that. My mom told me to write the book I most wanted to read, and I took her advice. Bodies of water too dark/murky to see into. There are movies coming out this fall?! I’m living in my office right now writing book two. Thanks so much Kristin for answering my questions! I can’t wait to read AMBER SMOKE! Thank you! This interview was a lot of fun!! 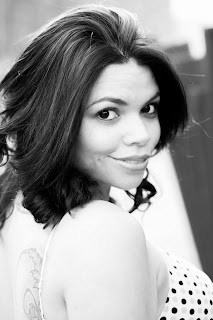 Check out the Tour Schedule over at Me My Shelf And I! Congratulations on your book! So exciting! Do you find it difficult to start on the next books? Thanks for the giveaway! Congratulations on your new book Kristin! I had no idea she had a new book/series out, but it sounds pretty interesting. Thanks for the giveaway!